I'm a sucker for a bit of floral cross-stitch goodness, i have a box full in my linen closet that i've collected from oppys. Usually i just can't bear to cut up & create something that someone has put so much hard work into, but i love this new find so much that i don't like the idea of it hiding away in a box - so i think this one will be turned into a pretty cushion for our bed. Good old country town thrifting, always comes up trumps! Once again i'm linking up with Her Library Adventures..........pop on over to see some more thrifting loveliness & all the usual awesomeness that Sophie shares with us. It's so pretty I have tons but I want to put them to use so they can be seen! Gorgeous! Its not often I see blue ones like this! 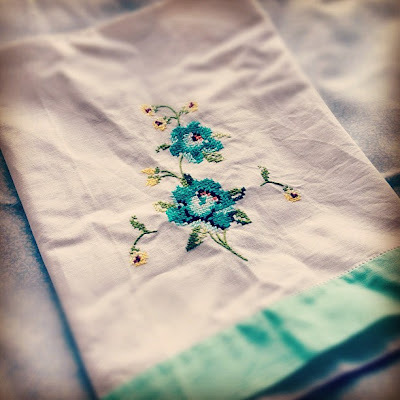 Love vintage linens - like you find it difficult to cut up, but this will make a lovely cushion.